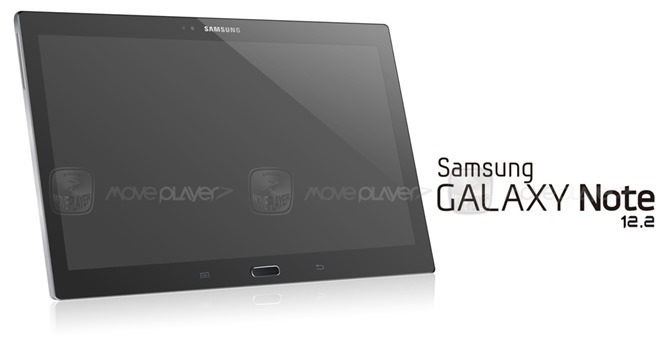 Samsung's Galaxy Note 10.1 is due for a refresh along with its smartphone cousin. 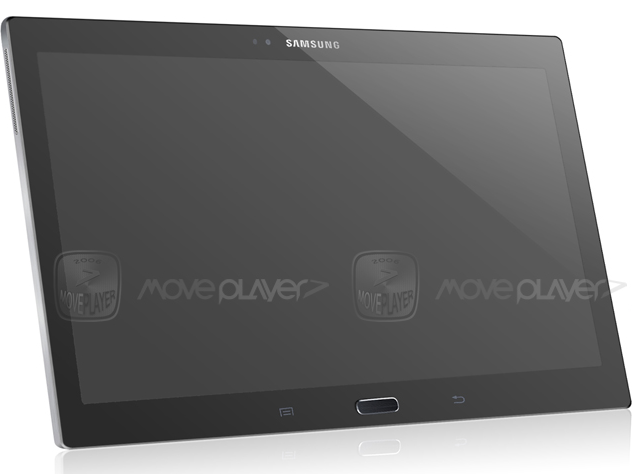 If you've been waiting for a high-end Samsung tablet (or just a tablet that's considerably larger than the current 10-inch breed), the folks at Korean site MovePlayer may have spotted it. A single photo of a hitherto unseen Galaxy Note 12.2 bearing the obviously huge screen and Samsung's increasingly ridiculous physical Home button was leaked earlier today. According to the leak, the newest Galaxy Note's 12.2" screen uses a 2560x1600 panel, which seems to be the de-facto standard for high-end Android tablets at 10" or larger. Further hardware details are left to the imagination, but it's a safe bet that a Samsung device in this configuration would be intended as a flagship tablet. That would make sense considering how Samsung is pushing the Note series towards the high end of the market and the Tab series towards the low end. If this is an authentic photo, it represents a slight shift in Samsung's industrial design: the corners of the tablet are considerably more rounded than the Galaxy Tab 3 series. This would be in line with the more perpendicular look indicated by leaked photos of the Galaxy Note III's screen. As the screens get larger, the physical Home button and flanked capacitive menu and back buttons that Samsung's tablets have inherited from the smartphones seem even more unwieldy. I'd recommend caution on this particular leak. First of all it's a single, low-resolution, press-style image, which makes it quite easy to fake. That said, it fits in with Samsung's design philosophy as of late, both in terms of physical design and in scoping out all product niches. It's possible that such a device could debut in the Galaxy Tab or Galaxy Note series, perhaps next week at Samsung's pre-IFA event in Berlin. While a Note 12.2 would be relatively huge, it wouldn't take the title of largest Android tablet yet. Disregarding alternate form factors, Toshiba released a 13.3-inch tablet in early 2012.